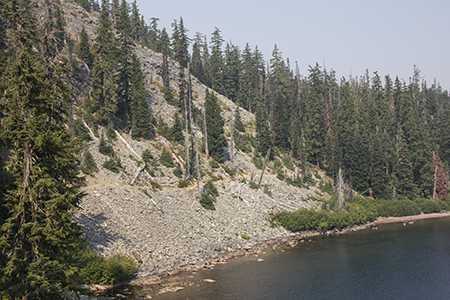 Waldo Lake and the Jim Weaver National Recreation Trail - Explore! 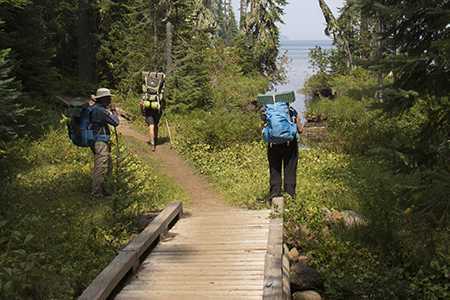 Waldo Lake and the Jim Weaver National Recreation Trail - Explore! Waldo Lake is located in central Oregon 12 miles north of Highway 58 between Willamette Pass and the community of Oakridge. 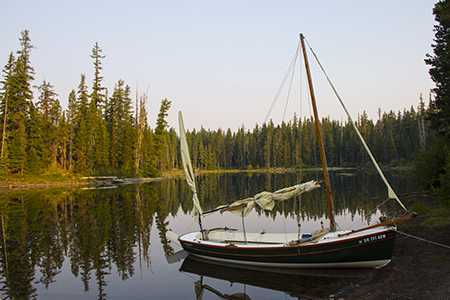 The lake is about 75 miles from Eugene, Oregon, 80 miles from Bend, Oregon and 115 miles from Klamath Falls, Oregon. 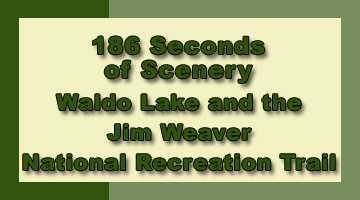 The Jim Weaver National Recreation Trail circles the lake and was formerly named the Waldo Lake Trail (#3590). 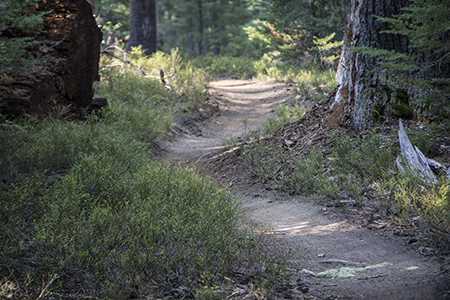 The trail was renamed and designated as a National Recreation Trail in April 2008 to recognize the contributions of former Oregon Congressman, Jim Weaver. The trail is 19.6 miles long, officially. The trail is used by bicyclists, equestrians and hikers. 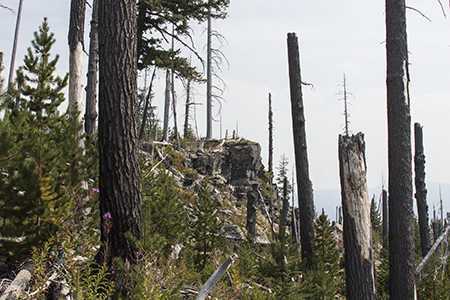 I hiked the trail over three days, backpacking along the way with members of the Klamath Basin Outdoor Group. We hiked the trail on weekdays in late August and saw no other people until our second day of hiking, near the north end of the lake. While the trail is in good shape and well used, especially by bicyclists, it is still possible to get away from it all during the week. The lakes in this area are notorious for their mosquitoes. Given drought conditions and traveling in the latter part of August, we found only a few hungry mosquitoes and the trip was quite pleasant in that regard. 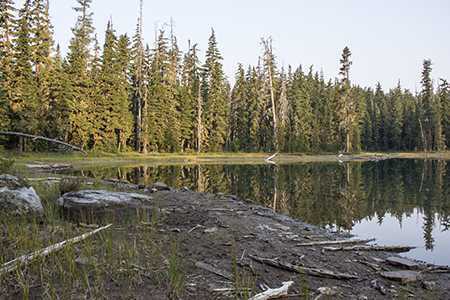 Waldo lake is one of the largest natural lakes in Oregon covering an area of 9.8 square miles with depths of up to 427 feet. It was formed when a fault block dropped into the earth creating a large and deep hole that was subsequently modified heavily by glacial activity. Evidence of the glacial activity can be seen on a section of the trail at the northwest corner of the lake. There the trail seems to be located on pavement. The pavement is actually bedrock and on the rock are striations caused by glaciers grinding into it. The water of the lake is exceptionally pure as there are no inlets to bring nutrients into the lake. This minimizes plant growth and decay, leaving water so pure that one can see to depths of 120 feet on a quiet day. Native Americans used the area extensively before the arrival of European explorers and settlers. 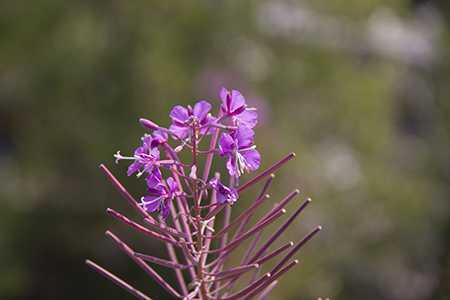 Deer, elk and huckleberries were, and are, attractive foods available in the area. Evidence of food gathering sites and temporary camps are in the area, but we weren’t looking for these sites and didn’t notice any. During historic times, the lake was believed to have been rediscovered by Charlie Tufti and named Pengra Lake after Byron John Pengra (1823-1903). Pengra was said to be the first Republican in Oregon and a forceful advocate for the Lincoln/Hamlin ticket in 1858. He held the office of State Surveyor General for a term and was a promoter of a railroad connecting Portland to San Franciso. The lake was later renamed for Judge John Breckenridge Waldo. Waldo served a term on the Supreme Court of Oregon and a term in the Oregon House of Representatives. He developed a strong appreciation for the Cascade Mountains and was instrumental in the creation of the Cascade Range Forest Reserve that was created in 1893. 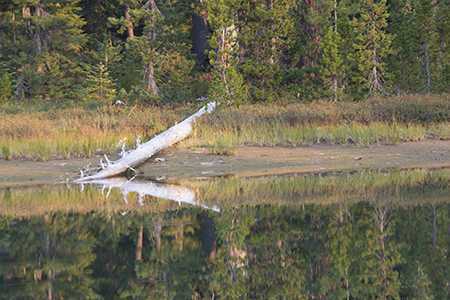 Our path crossed that of Judge Waldo at Island Lake in southern Oregon where a tree inscribed with his name and the names of his traveling companions remains. 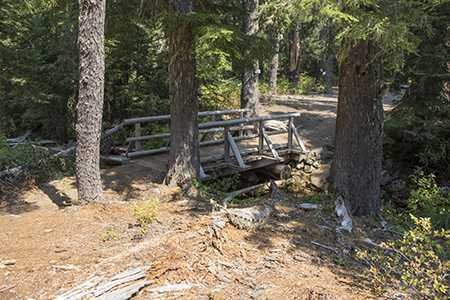 In the late 1800’s and early 1900’s the area was used by sheep herders and trappers and by 1923 several trails connected the lake to the Oakridge area. 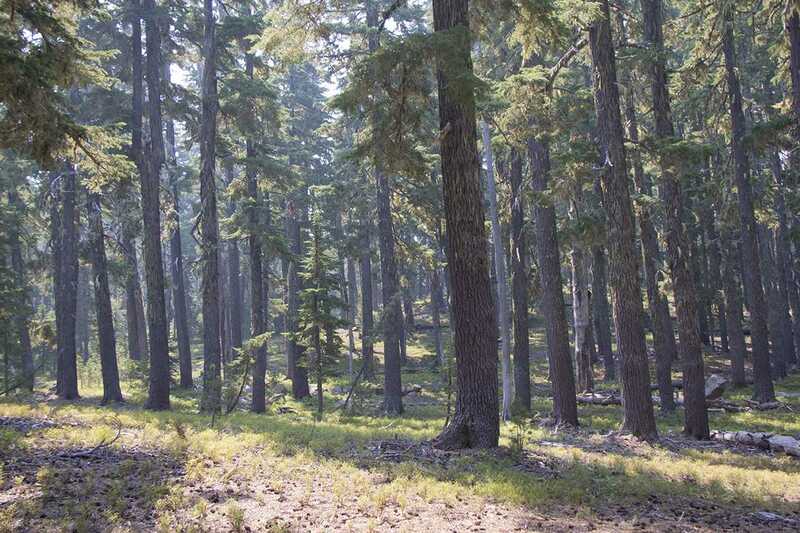 According to the Forest Service, construction of the access road from Highway 58 began in 1964, and the last of three campgrounds was completed in 1971. 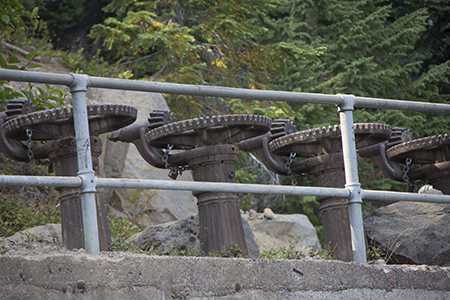 The campgrounds have over 200 developed sites with toilets, potable water (when the system is operational) and boat ramps at Waldo Lake. An additional 50 or so dispersed sites are scattered around the lake. Most of these have been used since the 1950s; some are heavily used. 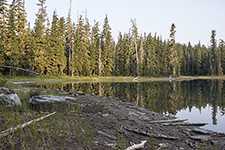 Unlike the developed campground sites which are set back from the lake, most of the dispersed sites are close to the lakeshore and have only a primitive fire ring. 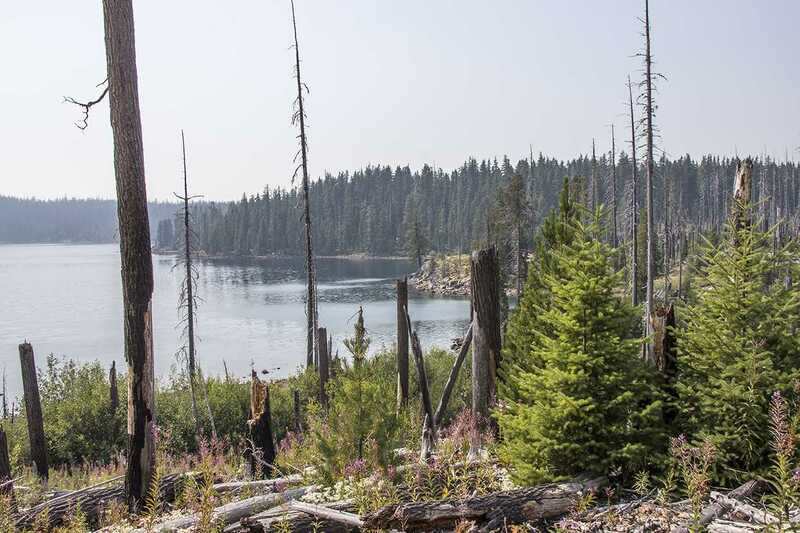 Access to some of these sites is via the Waldo Lake trail and the rest by water. 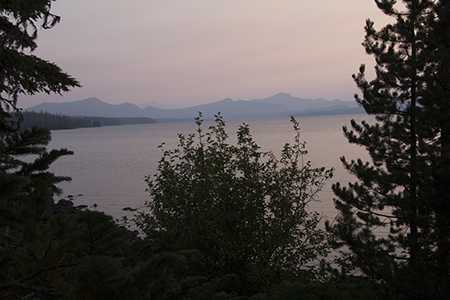 Camping is not permitted on the islands in the lake and motorized boats are limited to those with small electric motors. Canoes, kayaks, sailboats, paddle boards and rowboats are welcome on the lake. An interesting historical footnote is the Klovdahl Tunnel. The idea behind the tunnel was to bring water from Waldo Lake underground to serve irrigators in the Willamette Valley. 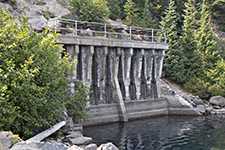 The Waldo Lake Irrigation and Power Company, led by engineer Simon Klovdahl, began construction of the headgates and the tunnel beginning in 1909 and continuing year-around until 1914. Declining financial feasibility and public opposition brought an end to the project, leaving the work that Klovdahl completed as a testament to his efforts. We began our journey at the Shadow Bay Campground and the trailhead near the boat launch on the southeast corner of the lake. We headed southward then westward going around the lake in a clockwise fashion. There was smoke in the area from large wildfires burning in Crater Lake National Park to the south and in National Forests to the west as can be seen in the photos and video. 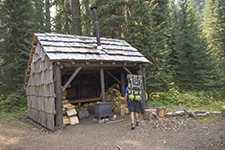 The highlight of the first section of the trail, beyond the views of the lake, is the South Waldo Shelter. The shelter is too close to the Shadow Bay Campground (about 2 miles away) to be typically used by backpackers. It is set up instead for cross country skiers. The road into Waldo Lake is normally closed by snow in the winter so experienced skiers use the Waldo Lake Sno-park or the Gold Lake Sno-park and ski in to the shelter. It has a wood stove and a stock of split wood. 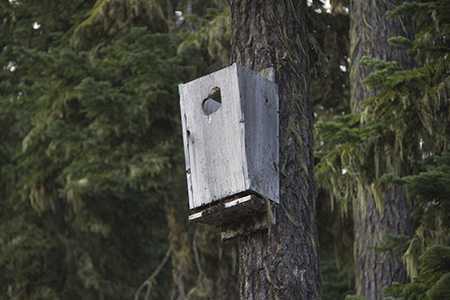 Inside the shelter is a sleeping platform and a broken splitting maul. If you need kindling, you might be able to make some with the broken maul and a big rock. There is a nice picnic table outside the shelter so it does make a good rest stop for hikers. The original plan was to hike in 5 miles or so and set up camp on the southwest side of the lake. As we hiked through that area we didn’t see any prepared campsites so we pressed on to Green Lake. 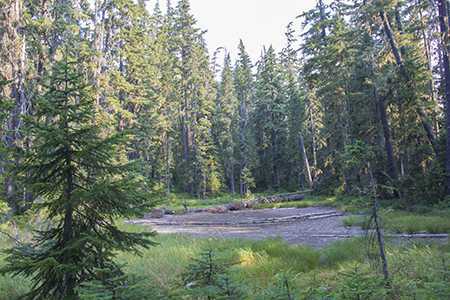 The Forest Service notes that there are “several short, fairly steep pitches” south of Green Lake. That’s a true statement. While there isn’t much climbing involved, these pitches spread over something like four miles were taxing. Along the way we took a detour to Klovdahl Bay after spotting a trail. It was clear the trail was not the main trail as it lacked bicycle tire tracks and was not as well used. The photo shows the trail marker carved into a tree along the main trail. Since we hadn’t done our research beforehand, the “KLOV” on the tree didn’t mean much, but the trail was intriguing and it headed toward the lake so off we went. It was a short trail through the woods, across a scree slope and down to an interpretive sign and the Klovdahl Tunnel. We took a break there, shot some photos and video then hiked back to the main trail the same way we came. A bit of the history of the Klovdahl Tunnel is discussed above. The interpretive sign added an interesting factoid: “If Waldo Lake had been used for irrigation for just one season, it’s estimated that the water level would have dropped 25 feet and taken ten years to refill.” If it was still being used for irrigation today, the lake would offer a much different experience to visitors. Fortunately, no water ever flowed out of Waldo Lake. As we continued toward Green Lake we noted one campsite below the trail that could have accommodated a couple tents. There was another tent space on the trail just north of the Trail 3551 intersection. There were several small ponds along the trail that would offer water in an emergency, however they were all circled with muddy shorelines that looked like they would snare an unwary hiker. We continued on. Trail 3576 crosses the main trail at Green Lake and continues to Waldo Lake. We started down that trail expecting to find a place to camp. There is a nice camping area just above Green Lake, with a fire ring, that can accommodate several tents. We camped there and had no company. While most of these kinds of campsites have fire rings, usually made of rocks, we don’t consider it safe to be lighting fires when the forest is as dry as it was during our visit. Instead, we carry gas stoves designed for backpackers – in my case a JetBoil Joule. We first got some water out of Green Lake, then walked down the trail toward Waldo Lake. Note that one should never drink water from any lake without filtering it first. I carry a small, light-weight filter that is fairly slow to fill my water bottle, my traveling companion was carrying a heavier filter system that was much quicker. But, I digress . . . The trail to Waldo Lake hadn’t been maintained and there were a few trees across it, but it was passable. Just above Waldo Lake we found another large camping area, again with no one using it. This area as well as the one we used are great spots for larger groups with several tents. We returned to our tents for the night, having walked 8.2 miles our first day. We continued north along the west side of the lake on our second day. For the largest part of both days we were either far away from the lake or well above the lake when close to it. Thus, although we were walking around a lake, it was not as easy to find water as I had initially imagined. In this area the trail is much easier to hike than the portion south of Green Lake. We saw other people for the first time near Elbow Lake where a family had day-hiked over from Salmon Lakes, to the west. They hadn’t seen Waldo Lake before and were thrilled to find a lovely little beach that was, unfortunately, straight down a rocky slope. I spotted an old trail that headed down the slope so that helped them some. 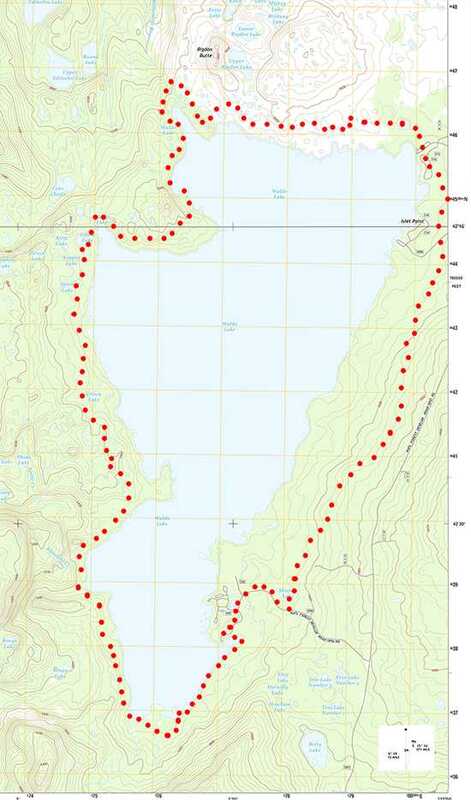 The trail in the Elbow Lake vicinity is an example of being close to the lake as shown on the maps, but far away in terms of the ease in getting down to it. 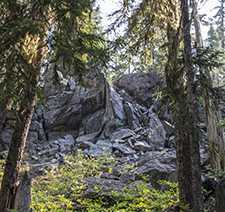 As we went through the large peninsula that is just past Elbow Lake we began seeing some interesting rock formations. As most of the geology in this part of the world, these rocks (photo to the right) were volcanic in origin. As we continued on we came upon fresh horse tracks in the trail entering from Trail 3597 at the northwest corner of the lake. It was in this area that the trail became solid rock – almost like pavement. A close looked revealed grooves carved into the rock, apparently by the glaciers that once moved across this area. As we began heading east, we came upon a nice campsite situated above the lake, but with easy access to water. This would have been a nice site to use while day hiking northward to explore the many small lakes and ponds there. We continued on, finally seeing the horses that preceded us near the intersection with Trail 3583. Then we came to the burn area. In 1996 the lightning-caused Charlton Butte Fire burned 10,400 acres of the forest along the north side of the lake. 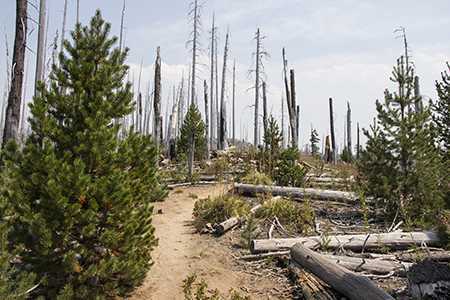 Most of the fire was in the Waldo Lake Wilderness and thus did not get the benefit of reseeding except from the few trees that survived. 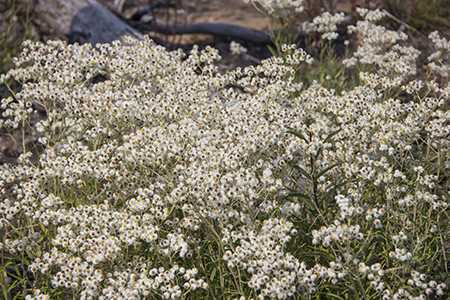 Now after nearly 20 years, some small trees and a variety of wildflowers are rising above the rocky landscape. Still, snags continue to fall across the trails in the area. 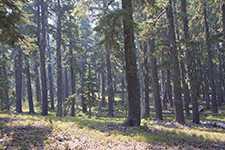 With declining National Forest budgets, volunteer groups are attempting to keep the trails open. There is almost no shade along this section of the trail and we crossed it in the middle of the afternoon – it was hot! We marched through the area to the North Waldo Campground where we set up camp after hiking 10.8 miles. 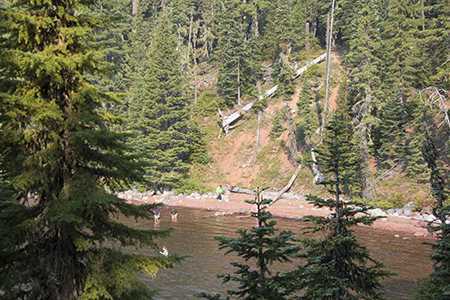 According to the Forest Service, the North Waldo Lake Campground is the most popular of the three full-service campgrounds along the lake. The campground has 57 sites, a boat ramp and dock, picnic tables, composting toilets, and, normally, drinking water. When we were there, the drinking water was out of service as contractors were replacing the entire system. As a consequence, the fee for using the area was reduced. On our final day, we walked the trail southward on the east side of the lake back to Shadow Bay. The trail in this area is far from the lake, so there were no lake views or access to the water without bushwhacking through the woods. 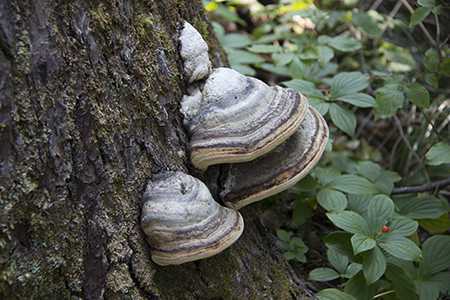 The trail itself is well maintained and leads through open forest that is the home to deer and a variety of smaller wildlife. Along the way, we came across a tree that had been struck by lightning, displaying its broken top and lightning-scarred bark. We reached Shadow Bay after hiking 7.3 miles. 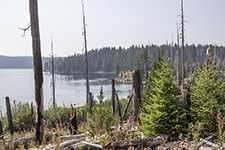 The video offers a quick look at some of the Waldo Lake Scenery including a variety of panoramic views of the lake and a little friend at a campsite. The smoke from fires at Crater Lake National Park and forests to the west limited visibility to a few miles. On a clear day, more distant mountains would be visible. You can find a larger version of the video on our YouTube page. Our total hike was 26.3 miles, considerably more than the official 19.6 miles of the Jim Weaver National Recreation Trail. The additional mileage was a result of some meandering and exploration we did along the way. You should plan for some of that when you take the hike. The major lesson learned here is that even though the trail is generally adjacent to the lake, it mostly isn’t very close to the water. In an effort to save weight, I only carried a quart of water when two quarts would have been better. It’s also important to top off your water bottles when the opportunity arises. 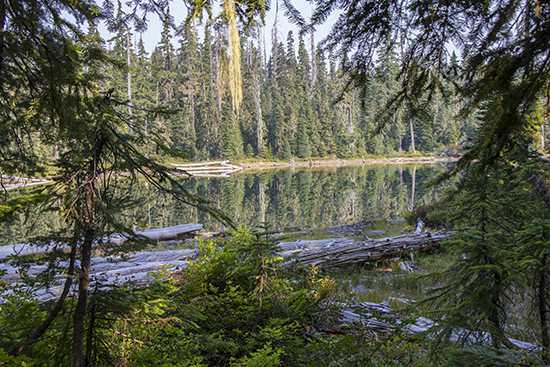 The Forest Service reports a lot more campsites around the lake than are accessible from the trail. That presents a great opportunity for canoe camping. Finally, to avoid the mosquitoes, plan your trip for later in August. The text, photos and video were created by Jerry Haugen and ©2015 by Global Creations, LLC, all rights reserved. The background music in the video is Colors of Life written by Mike Brassell and published by Digital Juice Music, Inc.
Not sure why I wrote “counterclockwise” that’s been fixed. Glad you enjoyed your trip. We took a break just at the beach just west of the west edge of the burn – that also looked like a good place to camp. There were some people enjoying the beach there when we went by. We continued on to the campground, just because. The rates were reduced due to the lack of running water and we got half off with the senior pass then split the cost in half so the cost didn’t amount to much. 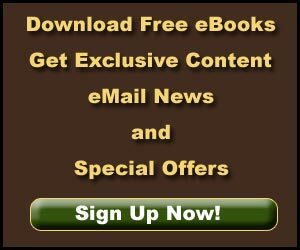 A good story about your hike. One correction, you went clockwise around the lake, not counterclockwise. The first night we camped at a small lake about a mile before Green Lake. It had good access to water and good camping. We each carried a quart/liter of water and that served us to our second camp just short of the east end of the burn, although we did see water sources a bit off the trail. Admittedly it was not as hot as when you did it. The campsite here was in an unburned area on the shore of the lake. We saw a total of about 6-8 bikers on on the first two days of the hike, none on the last day. All of the bikers yielded to us and were friendly. My GPS read exactly 22.00 (!) miles when we got back to the car.